For me it was a culmination of practical thrift, community action – and a working bumblebee which inspired an unadulterated fascination with natures symbiotic relationships and how they can create an astonishing abundance. An abundance which serves mutual benefits for multiple species and organisms – plants/mammals/birds/insects/soil. It was a compelling moment which directly inspired the organisation of seed swaps, and all that followed – SeedKeep, study, seed production and my current work. Thanks Bee. Knowing where your seed is produced provides practical transparent provenance. It means it has been adapted to successfully grow and reproduce in your environment. Building a relationship with your local grower, whether of produce or seed, also opens an essential channel for feedback, development and a richer food culture. How was the Irish Seed Savers Association born? The founders, Anita and Tommy Hayes, were aware of the past century’s international losses to crop diversity, and wondered who was conserving the diverse range of seeds, used and saved by generations of growers, throughout Ireland? By consultation with the Department of Agriculture, Food & the Marine (DAFM), and nationwide community appeals, a collection of seeds, often with associated stories, began to develop. 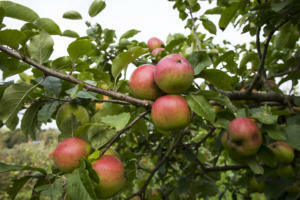 It included apple tree varieties, and as the collection and seed reproduction needs grew, the operation moved from humble beginnings in Co Carlow, to become the 20 acre farm, with the national heritage orchard of 170 varieties and seed bank with over 600 varieties, plus associated training, sales and workshops that it is today. There are many wonderfully delightful and exotic varieties which grow very well here. But their promotion can overshadow the staple stalwarts which can feed us all year round. To disregard the obvious could be a fundamental error, so here I’ll proudly wave a leaf of Uncle John’s Kale. This can currently be found both outdoors and undercover in schools around my region in North Connaught. I’m not aware of any area it doesn’t like to grow. It tastes good now, is fine for smoothie lovers, it will produce throughout winter, and was still healthy and sweet this past April after overwintering. It also reproduced perfectly true from seed produced outdoors, 3 years ago, on a local organic farm. The Irish Seed Savers Association aims to conserve Ireland’s specialised plant genetic resources. Their work was initially based on a small farm in County Carlow before moving to Capparoe, Scarriff in 1996. 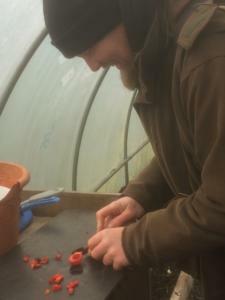 They focus on the preservation of heritage food crop varieties that are suitable to Ireland’s unique growing conditions. Irish Seed Savers are responsible for maintaining Ireland’s public seed bank, with over 600 non-commercially viable varieties of seed. Their work also incorporates locating rare varieties of vegetables, soft fruit, flowers, grains, potatoes and apple trees in order to research and gather more information on these species. Other significant projects have included; The establishment of a colony of hives of the native Black Bee, The creation of the Native Irish Grain collection with 48 varieties and the creation of a Native Broadleaf woodland and wildlife sanctuary. Irish Seed Savers also run workshops throughout the year, informing and teaching others how to save seeds, grow their own food and be self sustainable. They grow, preserve, conserve and share both their seeds, their knowledge and their love for the land!